controller powered by a Raspberry Pi Zero. Chris Lathan. “I couldn’t find anything I liked, so I designed my own.” As a geek, an engineer, and a maker, Lathan has worked in a variety of engineering roles for the past 15+ years. He fused his extensive mechanical and electrical engineering knowledge to create OmniJoy to fill the void he found in the market for configurable controllers. OmniJoy features a custom printed circuit board that integrates all of the components Lathan felt a controller needed. 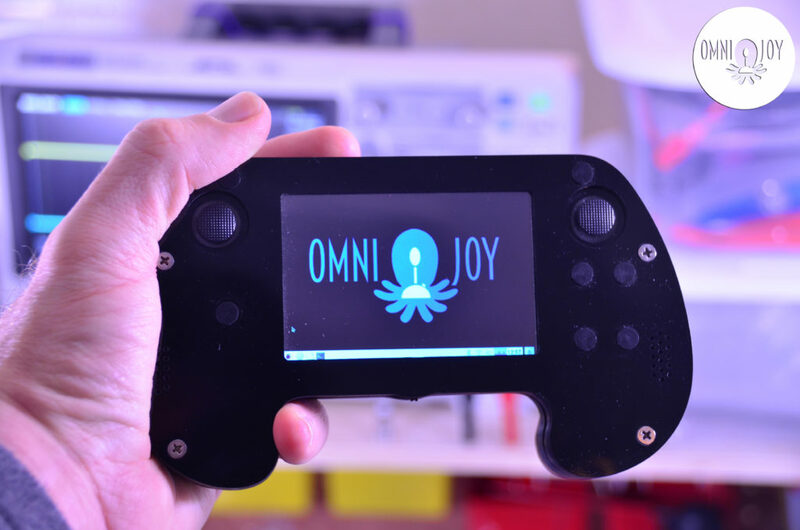 OmniJoy consists of two analog joysticks, two shoulder scrolling wheels, a face-mounted navigation switch and six buttons that are all software configurable. The integrated 3.5” touchscreen display can be used to create any additional controls, and a full-size USB-A connector simplifies expandability. An on- board Arduino-compatible processor provides real-time IO to give low latency when precise timing is critical. Other features like the high frame rate display, integrated audio, and room for two large batteries make it excellent for gaming as well. The components are well supported by the maker/Raspberry Pi community. While the circuit board is usable alone, OmniJoy is offering its Kickstarter backers several other options, from a case with 3D-printed handle grips to a fully-loaded robot-ready version featuring handcrafted Bolivian Rosewood grips. The case is a laser cut stack-up that makes modifications simple. OmniJoy’s grips are available in bespoke Bolivian Rosewood. “We wanted it functional, hackable, and good looking,” said Lathan. OmniJoy is fully programmable and comes with all the configuration files, drivers, and source-code you need to get started. It can be used as-is, as a portable, handheld, Raspberry Pi-based Linux computer. By adding additional software or programming it, OmniJoy can control widgets, robots, and even your home. It can also be used as a portable RetroPie device. The ways you can use OmniJoy are endless! We can’t wait to see what our users come up with! OmniJoy is available now for pre-order on Kickstarter.